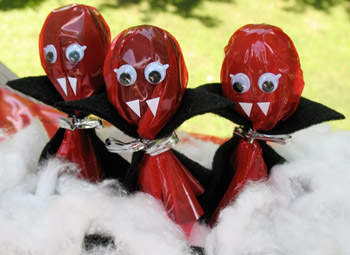 These cute little vampires lollipops will make great party favors for your Halloween party — be sure to make plenty, they’ll fly off before you know it. Be sure to visit all of our other ghostly crafts, scary printables, fabulous costume ideas and these spook-tackular Halloween recipes! As well, explore our fall crafts, our great fall recipes and printable activities. Using the pattern, cut capes (one for each lollipop) from black felt. To add some variety, try using different colors of cellophane such as orange, green, or purple. Bend the ends of the twist ties to look like bow ties. Try creepy eye Halloween stickers instead of wiggle eyes. I love to reuse my spaghetti sauce jars to create these beautiful pumpkin lights for All Hallow’s Eve! You can use different size jars to make a spooktacular display! Optional: other things to decorate, a hammer and nail to punch holes in the lid if you want to use the lid but light the candle inside. Tear orange tissue paper and place glue in an easy to use container. You will be applying the tissue and glue with one hand and the other will be inside the jar. If your hand is small enough, insert your non-dominant hand inside the jar and then use the other hand to coat the jar with decoupage glue. Lay the strips of orange paper over the jar. Glue and place the paper until the entire surface is covered. Go over the entire surface of the jar with one more thin layer of glue. Allow to dry for a few hours. In the mean time, create your face with the black paper. When the orange layer is completely dry, glue the black paper on and decorate as you wish. If you want, you can either paint the lip of the jar green for the stem or punch holes in the jar lid and paint that green. Either works fine! When the jack o’lantern is completely dry (give it 24 hours after the last coat of glue) place a candle inside and light or place electric lights inside and plug in! Either one gives the pumpkin a lovely glow! Hey guys! well i was looking though youtube to find some fun fall projects to do ..something easy and doesn’t take alot of time…the first video is how to make a crochet pumpkin…great for Halloween or thanksgiving decor for your table …second video is crochet candy corn, super cute. hope you enjoy.